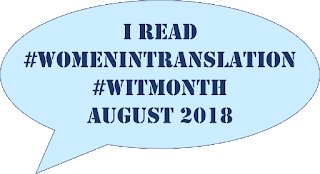 In the prologue to A Tale of False Fortunes, Enchi discusses a lost classic, a book she remembers reading in her father’s study when she was a young girl. Based on the classic historical work A Tale of Flowering Fortunes, the text she recalls is a variant telling of the same story. Her task here is, decades after reading it, to reconstruct, as much as possible, this lost text, and in doing so shed fresh light on historical events. If this all sounds rather dubious, that’s because it is. Translator Roger K. Thomas is quick to inform us in his introduction that the ‘lost text’ never existed. 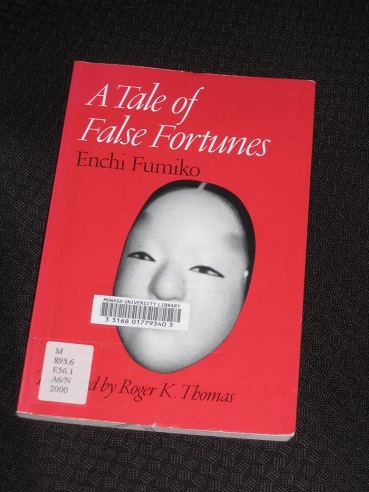 Instead, A Tale of False Fortunes sees Enchi, an accomplished classicist, take on the task of examining the original work through a feminist lens and reading between the lines. A Tale of Flowering Fortunes is ostensibly a historical text, a tale of Emperors and the court in the Heian era, with much of the focus on the all-powerful regent, Fujiwara no Michinaga, and a description of his inevitable rise to power. However, Enchi riles against this whitewashed version of history. Her focus is on the way Michinaga manipulates the young Emperor Ichijō to choose his own daughter Shōshi as a consort and get his grandsons crowned as emperors, thus strengthening the power of his direct line. The original text is history as ‘his story’, and Enchi’s retelling is very much ‘her story’, bringing Ichijō’s first wife, Teishi, into focus. Unlike the original work, A Tale of False Fortunes shows the machinations behind the throne, while also highlighting athe life of a proud woman who loves her husband and does her best to protect him and her whole family. Many of those who knew Teishi well enough to recognize her exterior beauty and sparkling wit knew nothing of the purity of her heart, which was as limpid as fresh water. Because of her all too dazzling beauty, the empress was easily misread as having a demonic ability to manipulate the emperor. In her naive innocence – her inability even to conceive of such scheming – lay the seeds of the adverse circumstances of her later years. Unfortunately, the second main protagonist isn’t quite as pure of heart. Kureha is a young woman placed at Teishi’s side by Michinaga (a kind of Trojan horse…), and she proves to be the catalyst for later events, mainly because of her youthful, and very human, flaws. However, it’s the third of the major female characters, the Emperor’s mother, Senshi, who proves to be Teishi’s greatest foe. Michinaga is her younger brother, and with family pride on the line, she’s determined to stop her son from making ‘mistakes’. These intrigues and betrayals make for a wonderful story, and anyone with a grounding in the Japanese classics will be familiar with the main figures and the setting. Enchi’s novel is a slow-burning story showing how Teishi is slowly isolated at court, and how the plan to turn the Emperor against his wife is painstakingly constructed. In many ways, what we have is a race against time. Michinaga’s attempts to undermine Teishi need to succeed before her son is old enough to be named as Ichijō’s heir (this is the Heian era, and succession isn’t quite as simple as you’d think). Otherwise, all his efforts to keep the throne in the family will have been in vain. Of course, it’s the feminist slant that lifts A Tale of False Fortunes above your average piece of historical fiction. Enchi’s decision to focus on the female figures at the expense of the men is the book’s main strength. We get to see Teishi’s true character in the writer’s portrait of a strong woman able to endure far better than her brothers, whose rash decisions cost the family dearly. The implication is that Teishi has been slightly slandered in A Tale of Flowering Fortunes, and this is Enchi’s attempt to set the story straight (there are definite echoes here of what Christa Wolf achieved in her novel Kassandra, letting the women of a classic story have their say). This looks terrific, Tony — thanks for bringing it to my attention. I loved Fumiko Enchi’s The Waiting Years and also liked Masks.